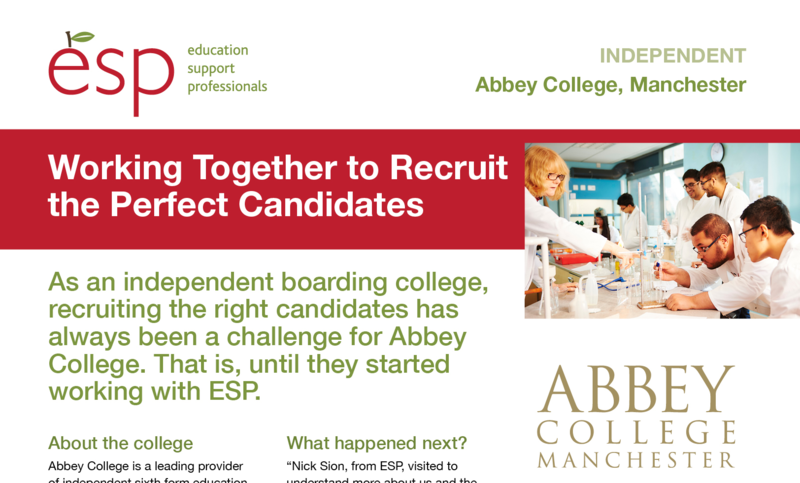 As an independent boarding college, recruiting the right candidates has always been a challenge for Abbey College. That is, until they started working with ESP. Abbey College is a leading provider of independent sixth form education in Greater Manchester and part of the Alpha Plus Group. The college offers GCSE and A Level courses to over 200 students, 60% of which are from overseas. The college employs 20 support staff. The roles that the Principal, Liz Elam needs to fill often demand a complex skill-set as well as candidates needing to align to the college’s ethos. Liz Elam explains, “We used to advertise support staff vacancies but, it was like trying to find a needle in a haystack. People would apply but they just weren’t the right fit for the college. “I was struggling to recruit an academic data manager, someone with SIMS, timetabling and academic management experience and the Alpha Plus central office recommended I contact ESP. handled the entire advertising and application process and, after filtering and interviewing candidates, put the four most suitable forward. All four were excellent, I interviewed two and hired them both. I didn’t want to lose them, they were such high quality. Nick has worked with us to recruit a director of accommodation and nurse, both very difficult roles to fill. Nick handled the whole process presenting us with very high-quality and suitable candidates. In both cases, we hired. I hired the nurse at interview, something I don’t normally do but Nick had found us the perfect candidate. “Not only is the process better value, it is so much easier and more effective than recruiting ourselves. We’ve employed very high quality candidates that we couldn’t have found. Contact us for an informal chat about how we might be able to support your recruitment on 0845 686 0690.